For decades I fancied myself as a night owl. I loved staying up until 2 or 3am, even if I had work the next day. Then life got complicated. I got married. I started working from home full time. I had kids. Now there are three people living in my house with me who demand attention — often at random times. I found that my time and energy were scarce commodities. My routine was to play catch-up during the evening and night hours, taking care of all the work that had been put off because of family demands. The problem was that by the time the kids were in bed and I sat down to work, I was exhausted. I’d attempt to focus on work. It wouldn’t last. I’d eventually slump back and fire up YouTube. I’d still stay up late, getting next to nothing productive done. Something had to change. Productivity was at an all-time low, projects were past deadline, and I always felt drained. I started getting into Tim Ferris. A lot of his ideas have changed the way I operate. One of the most effective has been adopting routines. This began with getting my sleep schedule consistent. That’s the first thing that the National Sleep Foundation recommends for better sleep: go to bed and get up at the same time every single day. But I’m pretty stupid in the morning. When I wake, even if I’ve slept great, I am disoriented and have no idea what’s going on. That’s when I started a morning routine. It’s a way of getting my mind and body ready to get things done. 4:00am – Wake. Drink water. 4:05am – Write. Whatever comes to my head. 4:20am – Prepare coffee with chaga. 4:50am – Enjoy coffee. Start first project of the day. Doing this exact routine every day has produced amazing effects. The water rehydrates and starts up the ol’ metabolism. Writing helps clear my mind. Stretching gets my muscles loosened up (many people exercise, but I’m dangerously groggy at this hour). Meditations focuses and energizes. Coffee and chaga give a boost to start the day. 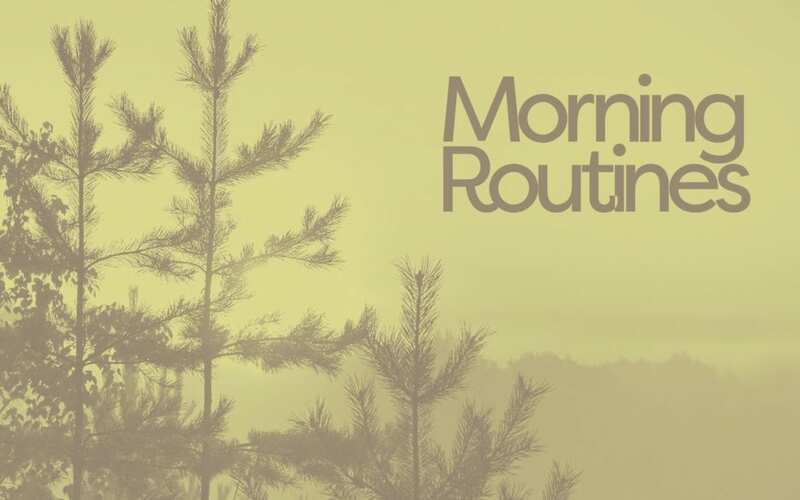 Morning routines will look different for everyone. I’m still experimenting — I’m thinking of stretching and meditating before I write. The key is to find things that work for you. Don’t be afraid to move things around and change things up until you find your groove. Also, the routine doesn’t have to take a long time. I’ve read about people whose routine lasts for hours. Quantity doesn’t equal quality. Whatever you choose to do, make it effective, and it doesn’t have to take forever. Once 5:00am hits, I’m at my most focused state of the whole day. I can knock out work in the next couple hours that would take me two or three times as long later in the day. Now I fancy myself as a morning person.